Volunteers helping with the clean-up on Shell Beach in Tauranga on October 15, 2011. The number of dead birds that have been recovered in the North Island bay, which teems with wildlife and is a nesting area for rare species such as the endangered New Zealand dotterel, stands at 1,000. In a wildlife rescue centre on New Zealand's Bay of Plenty, volunteers grimly bag the oil-soaked bodies of dead birds, victims of the country's biggest sea pollution disaster. Huge green bins are lined up in one corner of the centre at Tauranga to receive growing numbers of avian carcasses in the wake of an oil spill from the container ship Rena, which ploughed into an offshore reef on October 5. "It's not something you can ever prepare yourself for," vet Pauline Conayne told reporters, as volunteers clad in protective boiler suits carried out post-mortems on oil-covered birds in a screened-off area nearby. "When you see photos it touches your heart, but when you see it in person it's really devastating and quite hard. We're actually looking at bringing in a counsellor on-site." The number of dead birds that have been recovered in the North Island bay, which teems with wildlife and is a nesting area for rare species such as the endangered New Zealand dotterel, stands at 1,000. 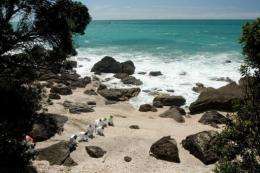 But Conayne estimates that may be only a fraction of the total killed on the oil-blackened beaches, wetlands and estuaries of an area regarded as one of New Zealand's environmental jewels. "What we're seeing as far as the dead population that has been brought in is only a very small portion of what has died out there," she said. No mammals are known to have died so far but wildlife teams are scouring the huge bay checking the seals, dolphins and whales that frequent its once pristine waters. Conayne said a handful of fur seals had been "pre-emptively" captured to keep them out of the path of the oil slick from the Rena, which remains stuck on the reef amid fears it will break up and release more fuel. At the wildlife centre a media minder, perhaps mindful of the region's reliance on tourism, tried to shepherd reporters away from a tent marked "post-mortem", telling volunteers not to display dead birds in view of prying cameras. But with oil-saturated birds washing up on a 60-kilometre (37 mile) of coast, images of environmental devastation have already been beamed around the world. The World Wildlife Fund's New Zealand marine specialist Bob Zuur described the sights confronting wildlife teams working along the coast. "We've been scaling the rocks looking for wildlife, it's difficult to see the birds and they appear frightened," he said. "We saw a shag about 20 metres offshore, flapping in the water, trying to clean itself. It couldn't fly, it couldn't dive, it didn't know what to do, and we couldn't reach it. It was heartbreaking." Yet there have been success stories, particularly treating little blue penguins -- the smallest species of the flightless birds, which have responded well to treatment for oil contamination. "Throughout the day they're fed, they're swum, and generally taken care of and loved to death," Conayne said, standing before a small swimming pool converted into a makeshift penguin watering area. The birds usually have a feisty nature and are behaving as normal, she explained. "The penguins are trying to tear people to shreds, so that's really good." WWF's Zuur said it would take years to know the full impact of the oil spill on the Bay of Plenty's ecosystem, which also contains huge marine kelp forests and is home to a large fishing industry. Conayne worries constantly about the disaster's impact on wildlife. "I look at every bird that flies over now and ask myself, 'Do you have oil, are you OK?'" she said.